Efforts remain underway to coordinate long-term housing arrangements for the families displaced by the Leta Brownscombe Co-Op fire on July 17, 2012. The Emergency Response Planning Team will be hosting a Housing Clinic for the families of the Leta Brownscombe Co-Op on Tuesday, July 24 and afterwards by appointment. Landlords with good quality, affordable rental accomodations available immediately or in the very near future are asked to provide their unit details to the CCRC Housing Resource Centre by calling 705-743-2722 or e-mail hrcpeterborough@yahoo.ca. Primarily there is a need for 1 and 2 bedroom units. In addition there is a specific need for three accessible, 2 bedroom units. When providing unit information please include the following details; size, location, rent, utilities (heating source and included vs excluded), accessibility, appliances, parking, other amenities and restrictions. Hours of Operation: Monday – Thursday - 9:00 a.m. to 4:00 p.m. Friday - 9:00 a.m. to 12:30 p.m.
Cash donation, cheques, gift cards, or VISA are accepted. Please make note that your donation is in support of the Leta Brownscombe Co-Op Fire Victims. Charitable receipts for cash, cheque, or VISA donations over $10 will be issued. The Salvation Army is accepting donations to directly support the victims of the Leta Brownscombe Co-Op fire that took place on Tuesday, July 17, 2012. Charitable receipts for cash, cheque, or VISA donations over $10 will be issued. 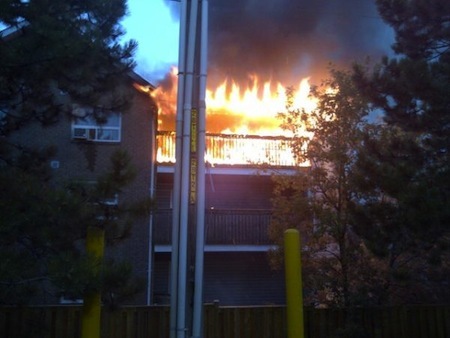 A huge fire last night destroyed much of the 34-unit co-operative apartment building on Milroy Dr. in the city’s north end behind Portage Place, and the Peterborough Fire Department and Ontario Fire Marshal's Office are investigating the cause. All residents are safe, but reports are some pets are missing. The Peterborough City-County Disaster Trust Fund is helping displaced occupants. Dramatic photos came in to us last night on Twitter—see our @Ptbo_Canada feed—including the one above. Here's a Facebook page with info on how you can help with clothing drive. Here's video Harrison Perkins captured at the scene.